A massive entangled network of 20 quantum bits has brought a quantum computer closer to reality. Scientists have made the biggest and most complex quantum-computer network yet, getting 20 different entangled quantum bits, or qubits, to talk to each other. The team was then able to read out the information contained in all those so-called qubits, creating a prototype of quantum "short-term memory" for the computer. While past efforts have entangled larger groups of particles in ultracold lasers, this is the first time researchers have been able to confirm they are indeed in a network. 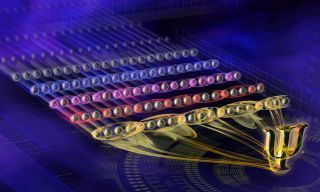 Their study, published April 10 in the journal Physics Review X, pushes quantum computers to a new level, inching closer to the so-called "quantum advantage," where qubits outperform the classical bits of silicon-chip-based computers, the researchers said. Traditional computing is based on a binary language of 0s and 1s — an alphabet with just two letters, or a series of globes flipped to either the north or south pole. Modern computers use this language by sending or stopping the flow of electricity through metal and silicon circuits, switching magnetic polarity or using other mechanisms that have a dual "on or off" state. However, quantum computers use a different language — with an infinite number of "letters." If binary languages use the north and south poles of the globes, then quantum computing would use all the points in between. The goal of quantum computing is to also use all the area between the poles. But where could such a language be written? It's not like you can find quantum matter at the hardware store. So, the team has been trapping calcium ions with laser beams. By pulsing these ions with energy, they can move electrons from one layer to another. In high school physics, electrons bounce between two layers, like a car changing lanes. But in reality, electrons don't exist in one place or one layer — they exist in many at the same time, a phenomenon known as quantum superposition. This odd quantum behavior offers a chance for devising a new computer language — one that uses infinite possibilities. Whereas classic computing uses bits, these calcium ions in superposition become quantum bits, or qubits. While past work had created such qubits before, the trick to making a computer is to get these qubits to talk to one another. "Having all these individual ions on their own is not really the thing you are interested in," Nicolai Friis, first author on the paper and a senior researcher at the Institute for Quantum Optics and Quantum Information in Vienna, told Live Science. "If they don't talk to each other, then all you can do with them is a very expensive classical computation." To get the qubits "talking" in this case relied on another bizarre consequence of quantum mechanics, called entanglement. Entanglement is when two (or more) particles seem to operate in a coordinated, dependent way, even when separated by vast distances. Most experts think entangling particles will be key as quantum computing catapults from lab experiment to computing revolution. "Twenty years ago, entanglement of two particles was a big deal," study co-author Rainer Blatt, a physics professor at the University of Innsbruck in Austria, told Live Science. "But when you really go and want to build a quantum computer, you have to work with not just say five, eight, 10 or 15 qubits. In the end, we will have to work with many, many more qubits." The team managed to entangle 20 particles together into a controlled network — still short of a true quantum computer but the largest such network to date. And while they still need to confirm that all 20 are fully entangled with each other, it's a solid step toward the supercomputers of the future. To date, qubits have not outperformed classical computer bits, but Blatt said that moment — often called the quantum advantage — is coming. "A quantum computer is never going to replace classic computers; it will add onto them," Blatt said. "These things can be done."